This is of the most serious all over prints I’ve seen in a long time. 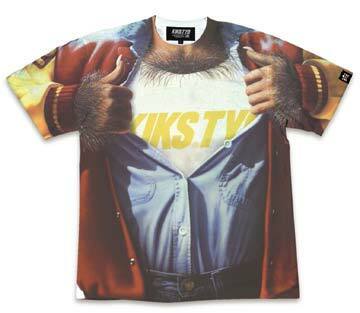 You might recognize the theme from Teen Wolf modified to represent the Kikstyo brand. The artwork in itself is pretty cool but I am amazed by the coverage of the print and the symmetry of how well it was executed. Get ready for more of these in the future. 15% Off at RAG New York Online Store! this shirts is so awesome! i can’t even believe how well it works on the shape of a flat tee. It will be interesting to see it being worn. Damn, this t-shirt is great! When I first saw it, I didn’t even know it was a t-shirt. Definitely a conversation starter.